There is no clear way to *export* the masks. That's it. This would be so, so, so much simpler. But yet there's only one post about this from 2009 with no editor change? I mean WTF? Wouldn't you just reverse the function of import and make it export? Please please tell me something cogent about this. Is this purely a feature request or, in the absence of the feature, do you want some recommendations on your process? A feature request. If it’s so obvious to go through minimum 3 things to save as a jpeg, why isn’t as easy to export as a jpeg? I guess I wasn't clear before: Do not use a JPEG to store a mask! I don't see how it would even work, as there is no 256-color mode for JPEG. JPEG is a lossy image format that introduces color distortion: some pixels that are all supposed to be the same color (especially around edges) will have slightly different shades. This means they won't be part of the mask. Using JPEG is therefore a certain way to screw up the mask. You should use PNG or BMP format, which are the only file formats AGS officially supports for masks. What are you talking about? Of course PNG and BMP work in Paint and Photoshop! I don't think anyone is currently working on updating AGS, so probably not. morganw was working on AGS Editor recently, so maybe he would like to, but I cannot say for him. Snarky I meant neither of these image formats have support in photoshop for saving as 8bit colour in a format that ags will accept. Only jpeg (ironically) seems to work. I’ll give it another go and see if I can record exactly the steps I take. 8-bit BMPs saved with Paint or Paint.NET work 100%, PNGs are supposed to also, but I have not tried them in a while (then again, I don't make much games). If they don't, then this may be a separate issue to fix also. In fact, if JPEG works for mask importing, that could be considered a bug. You mean - that it is included in a file filter? I think AGS uses same file filter for all image-related open/save operations. 8-bit BMPs and PNGs work in both Photoshop and to import into AGS (3.4.1) for me. I'm not sure how to import a jpg, photoshop doesn't offer the format up when saving while in Indexed mode and a regular jpg won't be imported by AGS. Saving for web will let me do it, but not the regular save functionality. AGS won't import either version of jpg for me. 4. Not great - AGS rejects it for having too many colours. 6. Be left with this. Bravo. 2. Grab the area of the actual background; I did it free hand, and did it pretty nice. This a 1024 background on a 1920 screen. 3. I saved it as a BMP 8bit, preparing to open it in Photoshop, zoom and cut to exact size, then select the whole area and paste it back into Paint.exe. Except then it said that "the colour quality will be reduced", and I was back where I started. So then I drew on the image, expressing my anger, and threw the entire thing out. So please explain to me: WHY not write the 25 lines of code to export the walkable areas/regions/hotspots/etc. as an 8bit BMP file? WHYYYYYY? Also, this is ignoring what would happen if I had 1920x1080 backgrounds; which was what I was trying to do in the first place! There wouldn't be enough screen realestate to do a proper screenshot. We could just get rid of all this mumbo-jumbo bs, and instead of trying an exact sequence of events, we could just ADD AN EXPORT BUTTON. I mean bx83's workflow seemed to suggest that. I'm not near AGS right now, so can't confirm. As you said, there's been one post about it since 2009 so there's not a lot of demand. Now, you've requested it again and if there's someone working on the editor, maybe they will add it. I don't think anyone here is arguing the feature wouldn't be useful, but as realistically looking at it there may not be any active development of the editor, trying to offer you help in improving your workflow (with photoshop alone you can speed that up and save to the correct format) but you already declined that support. Be my guest, please. As *8bit* PNG, or *8bit* BMP without changing colours. I cannot find a single way it can be done (perhaps in 320x200, but not anything larger with ease). I've tried more ways than I've shown here in tutorials. None work. What I don't understand is, if there's already an *import* function (for background image), why not an export (for walkable areas)? Why not take the background image import, reverse commands for a BMP/PNG/whatever, and so export it? Seriously, you are becoming one of the most obnoxious people I've met on this forum. What's with all that making those large unnecessary hysterical posts? We already got your request. No need to repeat same things over and over again. No one was arguing that this feature is not necessary. The people above were simply discussing the workaround you were using. BTW, The fact that AGS does not accept your 8-bit BMPs means only that you are not saving BMPs correctly. I guess when people want to have a mask in a file, they don't create it inside AGS in the first place. Instead they make masks in the image editor, e.g. as a separate layer, and keep editing them there. This way you do not need to export/import, only reimport from file. TBH the thing that you keep doing this tedious procedure made me very surprised. Personally, I'd never do such thing, as soon as I see how difficult and time consuming it is. b) people did not mention that much before, so contributors did not pay attention to this issue. You must understand, that AGS is practically a dead project. Less and less people working on it. And when they do, they do it when they have spare time and interest. No one here is obliged to do things for you. If you want something done now and fast, then hire a programmer and bug them instead. This is based off my work flow. I do all my hotspots / regions / walkbehinds etc. in photoshop, including any later changes, and then import the masks. This allows me to do some of the functionality you were looking for before, in terms of seeing all the different options at the same time. In my photoshop file. I'll have each hotspot etc as a separate layer, and each type in a group. That way I can turn things off easily, quickly line up different walkareas/behinds. I will then save to 8 bit bmp and import. These screenshots don't show hotspots etc. but it should make sense. 1. Take a screenshot on a white background as you currently are at 100% zoom. (Or, if you have a screenshot tool which has snipping built in when taking the screenshot, you can avoid some of the next steps). Okay, I'm sorry. Please don't get mad or read my posts imagining a hysterical voice; I am only trying to learn the AGS system. I understand Rome wasn't built in a day. I did not realise that simply making the post would put it in the feature request cue. Once again, I'm sorry. Alright, fair enough - but how *do* I save them properly? I must change the image, in order at least to resize. 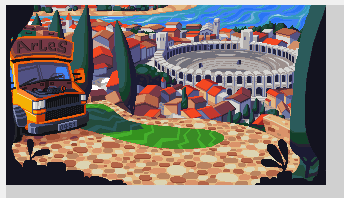 If I save in paint.exe as a 256-colour BMP, it reduces the quality of the colours, making them useless to re-import. 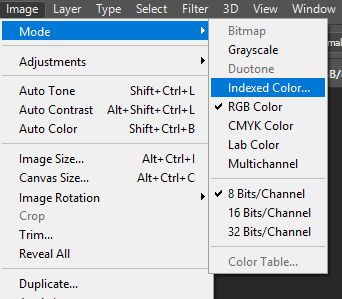 If I use Photoshop CS6, it does not offer the option to save it as 8-bit. True. I will try. But the last time I did offer $2,000, nobody took it up. I'll try another programmger hire site. I will try to import a background image and work on the image in a separate layer. However, this doesn't take care of saving, what editor or format, etc. I don't know, I'll leave the export till much later and hopefullly someone has figured something out in code.